Participation in the Na’aleh high school in Israel program has increased, largely due to the local economy. Mrs. Faingold explained that parents do not see a future in Ukraine for their children so they are eager to enroll their teens in Israeli high schools where they can begin to integrate into Israeli life even before university. Local officials in Kharkiv, said Mrs. Feinberg, are expressing concern about a Jewish adolescent “brain drain”, but she doesn’t yet know if such concern will develop into a serious problem for the program. In response to a question about JAFI summer camps, Mrs. Faingold said that Donetsk-area youngsters participate in the summer camp managed from the JAFI Kharkiv office. 51. 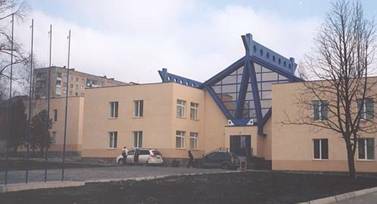 Ludmila Saprykina directs operations of the American Jewish Joint Distribution Committee in Donetsk, working from a small, overcrowded building that was built as a preschool. Unlike the Jewish Agency, the JDC mandate in Donetsk is confined to Donetsk and the surrounding area; the region does not included Kharkiv, which is managed separately. Ms. Saprykina said that JDC believes that the Jewish population in Donetsk oblast is about 15,000, half of whom reside in Donetsk itself. Outside Donetsk, the major Jewish population centers are in Mariupol, Kramatorsk, and Artemivsk. Smaller Jewish population centers – some with about 60 Jews – exist in even smaller cities that are (or were) mining or factory towns, dependent on mining and/or a single mining-related industry. The mines shut down and the local economy collapses; younger people leave, but older people lack the energy to uproot them-selves and therefore remain alone, said Ms. Saprykina. 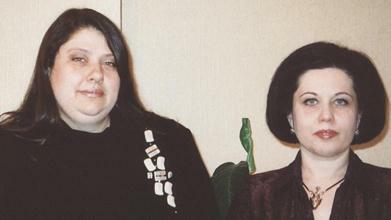 Ludmila Saprykina, at far right, and her deputy, Anna Salkova, manage JDC operations in the Donetsk area. The welfare program of JDC reaches 4,000 elderly Jews, 2,800 of whom are eligible for enhanced services through the Conference on Jewish Material Claims against Germany. JDC previously operated six heseds in the region, but financial difficulties have forced closure of three of them; those that remain are in Donetsk, Mariupol, and Kramatorsk, said Ms. Saprykina. Approximately 300 Jewish seniors receive patronage services, that is, shopping, cooking, cleaning, and other assistance provided to those who are homebound. Additionally, continued Ms. Saprykina, the hesed extends assistance to about 300 Jewish children up to the age of 18 and their families. This assistance includes psychological counseling, material goods (food, medicine, clothing), afterschool activities, and participation in a summer day camp that is operated in the large back yard of the hesed. Many of the families served by JDC are single-parent families in which the custodial parent is under enormous stress, said Ms. Saprykina. A Jewish community center program focusing on children and youth includes a youth club attracting about 100 teens, Israeli dancing, and informal Jewish education. Kabbalat Shabbat programs draw about 70 participants. Family Shabbatons are held twice each year. Additionally, all Jewish holidays are celebrated. A Purimspiel attracted about 400 local Jews, both seniors and youngsters. JDC was instrumental in obtaining use of a once-empty building on its grounds and in arranging for students to clean and renovate it. 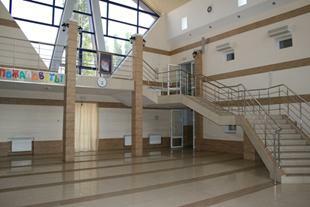 Ms. Saprykina expressed hope that Hillel would organize in Donetsk, using that structure as its base. Rabbi Vishedski has been helpful to JDC in all of its Jewish renewal programs, Ms. Saprykina said. In response to a question, she said that World Jewish Relief, the British organization, finances a large portion of the humanitarian aid extended by JDC through the hesed. One of the most critical problems for JDC in the area, said Ms. Saprykina, is the small size and the condition of the building that it uses; however, she believes it is unlikely that new quarters will be secured. The city enables use of the premises without charge, as long as it is used for social purposes. The building contains no elevator; thus, programs for older people are confined to the ground floor. Offices and activity space for youth are on the second floor. Although the previous Ukrainian government strongly encouraged the Ukrainianization of all Ukrainian place names, the Russian name of Krivoi Rog has continued to be more commonly used than is Krivyy Rih, the Ukrainian equivalent. The city was founded in the 17th century as a Cossack village, but expanded rapidly in the late 19th century following discovery and exploitation of high-grade iron ore deposits in the area. Krivoi Rog stretches some 130 kilometers (81 miles) in length, connecting numerous mining sites, some of them now inactive. Production of iron and steel, chemicals, and engineering equipment dominate its economic base. Krivoi Rog is located ap-proximately 136 kilometers southwest of Dnipropetrovsk. Its general population in 2011 is about 668,000. The Jewish population of the city is estimated by local Jews to be between 7,000 and 10,000. The extreme linear nature of Krivoi Rog has impeded development of a sense of community among local Jews. 52. The Ohr Avner Chabad day school now enrolls 84 pupils in grades 1-9. (In 2005, enrollment was 100.) A related pre-school program is housed elsewhere. The current school structure is a renovated older school that once consisted of three parallel buildings. The two larger original buildings now are connected by a sizeable atrium and the third building, to the left of the other two, is connected to the center building by a smaller enclosure. A five-sided modern glass and steel structure encloses a large new atrium connecting two of the three buildings of the Krivoi Rog Chabad school. Photo: the writer (in 2008). Currently under development to the right of the existing structure are additional buildings accommodating a new sports hall, assembly hall, and a preschool with a capacity of 45 children. The school grounds already include extensive play grounds and sports fields, perhaps the most substantial developed outdoor area that the writer has seen at any Jewish day school in the post-Soviet states. A portion of the large atrium is seen at right. Visitors have observed that the atrium stands empty most of the time and probably could have been used as a sports hall if it had been designed for that purpose. Instead, a new sports building is under construction for a school with a small and declining enrollment. amp;id=22&Itemid=148. Retrieved July 21, 2011. Na’aleh has generated periodic similar concern in other areas; from time to time, officials in different regions have attempted to curtail the program or have asked youngsters/families to sign pledges that Na’aleh participants will return to their country of origin after completion of high school and university studies in Israel. Such pledges are difficult to enforce and usually are considered meaningless. See pages 58-59 and 65-67 for information about JDC operations in Kharkiv.